CFK & IPAK Brands sell their entire handmade knife inventory below dealer wholesale, direct to their customers. There are never any dealer mark-ups or retail catalog mark-ups added, CFK & IPAK pass these savings onto you. We have the highest quality handmade D2, 1095HC, and Damascus knives on eBay, Walmart, and Amazon. Look no further for the best value for your money. We are so sure of our knives that we guarantee them for life. 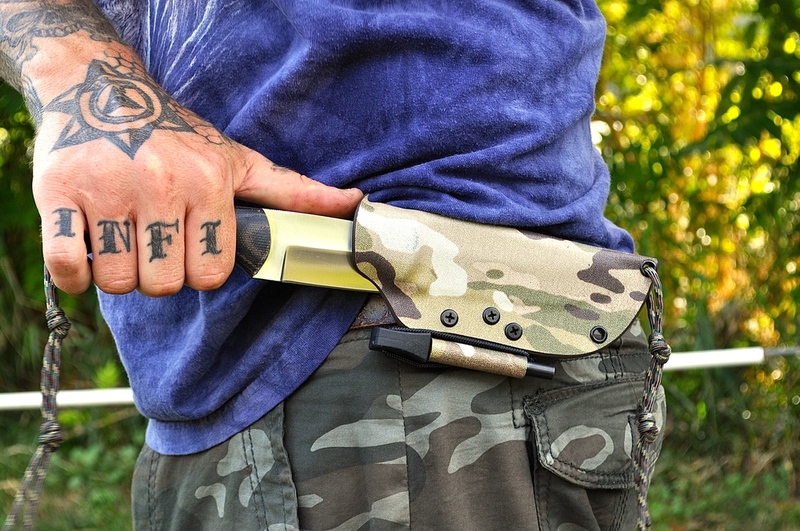 CFK Cutlery Co. is a private knife manufacturer for the CFK & IPAK knife brands. Our D2 tool steel is sourced in Japan and our 1095 and 15N20 are sourced from Europe and Sweden. Our exotic handle materials are sourced from all over the world, including the USA, and our micarta is made in-house from Egyptian cottons, canvases, and linens. Our manufacturing headquarters is located in England and our marketing, sales, shipping, and warranty services are located in Oregon and Florida. All our textured-micarta grips and scrimshaw bone, horn, and wood handles are made in USA. We use several USA craftsmen (Doug Wilson over at Yellow Hawk Kydex Sheaths) to handcraft kydex sheath-systems for our customers. Our premium buffalo leather is sourced from Italy and made into sheaths in England. We are also very fortunate to have famous Navajo's Brian & David Yellowhorse to customize many of our knives and we also have other professional US and European knife makers customize our blades and handles from time to time. Our knives are made very well and designed to last a lifetime. If you happen to break one of our knife blades or knock the handles apart, we will replace it. No replacements will be given without the original Certificate of Authenticity Card with the Warranty Record number on it, our warranty is reserved for the original purchaser, if you purchase a CFK / IPAK knife from a show vendor, you will need to return the guaranteed product to the vendor for warranty. Normal knife wear & tear and blade usage consisting of scratches, dings, dents, cosmetic blemishes, blade edge chips, broken knife tips, blade edge dings, re-sharpening errors, corrosion, rusting, pitting, carbon-burs, and tarnish of the knife are not covered by the replacement guarantee. The sheaths are not covered by the replacement guarantee.